A new countertop has the ability to transform a space. When you begin a property renovation, you will quickly realize how many different countertop options there are. There are endless price points, colors, and finishes, so there is something for every budget and taste. The first thing you should do before choosing a countertop is to determine how much material you need. This can be done by calculating the square footage, which involves measuring the length of the surface and the width of the surface and multiplying them together. Of course, this assumes you're measuring a perfect square or rectangle, which is not always the case. You may have to add or subtract if the area you are measuring is an irregular shape. The length of the island is 72 inches, which equals 6 feet. The width of the island is 48 inches, which equals 4 feet. Multiply the length (6 feet) by the width (4 feet) and you get 24 feet. Hence, you will need 24 feet of countertop material for a 4 by 6-foot kitchen island. Now that you know how many square feet of countertop material you need, you can set a price point. Counters are the icing on the cake. You can save money by installing a starter set of cabinets and then add the wow factor by selecting stunning countertop material. However, it is very important to set a price point before you start looking at materials. It is very easy to go over budget if you fall in love with a particular material. If you set a budget from the very beginning, you can ask to only be shown options in your price range. Property Value: Your price point should be influenced by the value of the property. You do not want to over-improve by spending more than the value the countertop will add to the existing property. Choosing a material that is $90 a square foot for a $1,000 a month rental is over-improving. You also do not want to under-improve. A laminate countertop in a million dollar home is an immediate turn-off for many buyers. However, a laminate countertop in a mid-range rental may be the way to go. Account for Additional Costs: A countertop may be advertised at $10 a square foot, but you must make sure you leave room for additional costs. Many fabricators charge additional fees for installation and sink cut-outs and edging. Be sure to ask beforehand if such factors are included in the price of the material. Example: You set a $1,000 budget for the 24 square foot kitchen island from above. You might assume that means you can look at materials that are $41.67 a square foot ($1,000 divided by 24 feet). However, that only covers the price of the material. If you choose a material that is $41 a square foot and assume you'll be in the $1,000 price range, you'll be in for a shock when your total bill comes to $1,600 including tax, installation, edging and cut-outs. If you are replacing counters in a rental property, your main concern will be durability. You want to choose a material that can take abuse, and will not stain, crack, scratch, or etch easily. You also want to choose something that is low maintenance and something that does not have to be oiled or sealed constantly. Quartz, granite, and laminate are popular choices for these reasons. For a property flip, you have more options. Your goal is to choose a cost-effective material—a material that will fit with the value of the property and attract buyers but not break the bank. The right countertop can be determined by the function of the space. For example, bathrooms and kitchens have different needs. In a bathroom, you need something that can be exposed to constant moisture. Butcher block counters and stainless steel counters are not good choices for a bathroom. In a kitchen, you need something that can withstand water, food, and drink spills.You also have to consider that pots, pans, and plates will constantly be dragged across the surface. Marble is not an ideal choice for kitchens because although it is beautiful, it is a soft, porous stone. Polished marble has its own problems because it scratches easily and is prone to etching. There may also be areas of the kitchen that have different needs and many people choose different countertop materials to suit those needs. For example, while marble is not ideal for the entire kitchen, it is wonderful for baking and making pastries because it stays very cool. 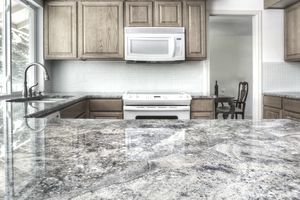 Many serious bakers elect to use marble in a designated pastry-making spot in the kitchen and choose another countertop for the rest of the space. You will want to make sure that the countertop material or the color fits in with the surrounding materials and design. For example, stainless steel, concrete, and quartz look great in modern kitchens but may look out of place in a more traditional or country style kitchen with a lot of wood cabinets. Before choosing a countertop, it is important to realize this is a decision that will likely be around for a while. Unlike choosing a paint color, which can easily be changed, a countertop is a large expense. You will want to choose something that has a timeless appeal. You may love that rainbow colored granite at the moment, but within a month may wish you had opted for the beige and brown instead. You also want to make sure the material you select has a broad appeal. When renting or selling the property, it is better to have a classic material that appeals to the masses and not just a select few.